The Milky Way, the galaxy we live in, is part of a cluster of more than 50 galaxies that make up the 'Local Group', a collection that includes the famous Andromeda galaxy and many other far smaller objects. Now a Russian-American team have added to the canon, finding a tiny and isolated dwarf galaxy almost 7 million light years away. Their results appear in Monthly Notices of the Royal Astronomical Society. Kks3 is a 'dwarf spheroidal' or dSph galaxy, lacking features like the spiral arms found in our own galaxy. These systems also have an absence of the raw materials (gas and dust) needed for new generations of stars to form, leaving behind older and fainter relics. In almost every case, this raw material seems to have been stripped out by nearby massive galaxies like Andromeda, so the vast majority of dSph objects are found near much bigger companions. Isolated objects must have formed in a different way, with one possibility being that they had an early burst of star formation that used up the available gas resources. Astronomers are particularly interested in finding dSph objects to understand galaxy formation in the universe in general, as even HST struggles to see them beyond the Local Group. The absence of clouds of hydrogen gas in nebulae also makes them harder to pick out in surveys, so scientists instead try to find them by picking out individual stars. For that reason, only one other isolated dwarf spheroidal, KKR 25, has been found in the Local Group, a discovery made by the same group back in 1999. 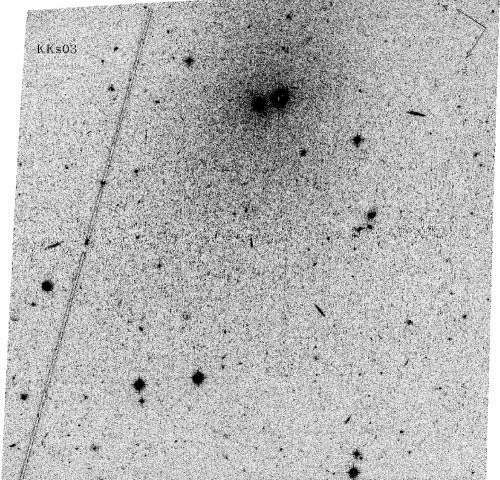 Team member Prof Dimitry Makarov, also of the Special Astrophysical Observatory, commented: "Finding objects like Kks3 is painstaking work, even with observatories like the Hubble Space Telescope. But with persistence, we're slowly building up a map of our local neighbourhood, which turns out to be less empty than we thought. It may be that are a huge number of dwarf spheroidal galaxies out there, something that would have profound consequences for our ideas about the evolution of the cosmos." The team will continue to look for more dSph galaxies, a task that will become a little easier in the next few years, once instruments like the James Webb Space Telescope and the European Extremely Large Telescope begin service. Just to clear up a couple of misstatements in the picture caption, the globular cluster near the center of the galaxy IS associated with KKs 3 and is not a member of the Milky Way's retinue of globular clusters (nor an intergalactic 'tramp'). The cluster is well seen (as inset) in Fig 1 of the relevant paper (link below). Also, according to the 'discovery' paper "The bright spot at the center of the galaxy, just to the right of the globular cluster...is caused by a tight pair of red foreground stars" and is not the "core of the galaxy" as stated in the caption.